Having a project management system for your team can help organize workflow, raise efficiencies and communication, and boost productivity. This tutorial shows you how to create and edit projects with the Due platform. A pop-up window will appear where you can enter information about the project. Here, you can add the project’s name followed by a description. The project description should focus on the goal of your project. Next, add a due date by clicking on the calendar icon to change the day, month, and year. Once you make these changes, the due date will be updated. There is also a place on the pop-up menu that shows you who is on the project team. Be sure to check our other tutorial about Adding Project Team Members. Finally, to save the project, click on the “Save” button. 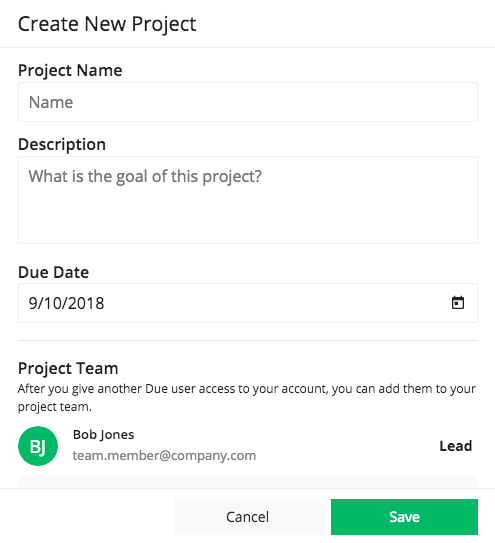 You will return to the “Projects” screen where you will see the project you created along with an “Add” button to continue creating projects. When you want to do more with a project, click on the project. Now, you will be able to add and edit tasks. This process is discussed in greater detail later in this tutorial. 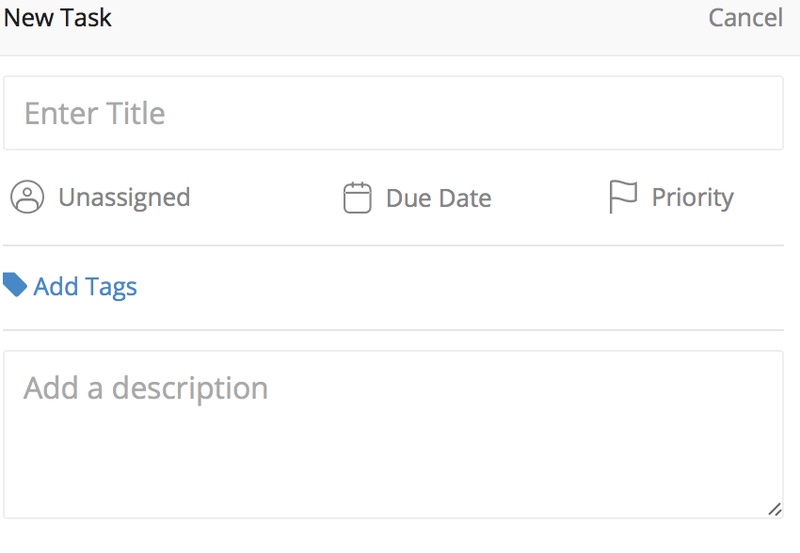 If you want to edit the project, click on the three dots on the right side of the project next to the due date. You’ll see a drop-down menu appear, which you can use to change settings, view activity, duplicate the project, or delete the project. Each project will have many tasks to complete. The next step is to add and edit tasks that relate to the project. The first step is to double-click on the project so that you can open it up. Here, you will see any tasks that have already been added. However, since you are just starting, it will be empty. On the right-hand side of the screen is a button that says, “Add Task.” If you click the dots on the side of this button, you can also select things like “Project Settings” and “Manage Tags” both of which allow you to further customize your project. To start, click on the “Add Task” button. A pop-up window will appear for you to enter information about one task for that project. Insert the task title followed by a box to add a description. You can also choose to add tags and files to accompany the task. Once created, there are options to add a due date, define priority level, and assign team members. These options are located on the right side of each task as small icons that you can click on individually. Since tasks auto-save, there is no need to use a save button for them. Within this area of Due Projects, you can also view task activities. Additionally, with each task, you can set a time tracker by clicking on the timer. When you click on the timer again, it stops the time and gives you a time amount that you can see logged under that task’s activity. Continue to add tasks to each project as needed. You will also be able to edit and delete these tasks using the same process as you did to create and edit projects. Within the task list, you also have drop-down menu options so you can search the task list by priority, status, starred or un-starred, and tag type. Lastly, Due Projects is a mobile responsive tool. That means you and your team can access it from all mobile and desktop devices to stay updated on projects and tasks. Stay tuned for more updates and improvements! Let us know what type of updated or new tutorials you want to see. 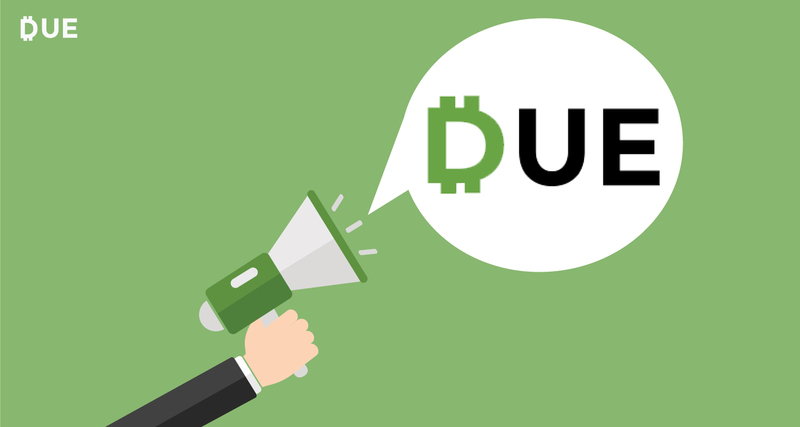 You can also reach out to support@due.com for more information.